Officers from US Customs and Border Protection (CBP) fired or threw the gas after a handful of migrants sought to open a small hole in concertina wire at a gap on the Mexican side of a levee. Images showed the migrants – men, women and children – running from the smoke. For a time, they also suspended all crossings at the world’s busiest land border. 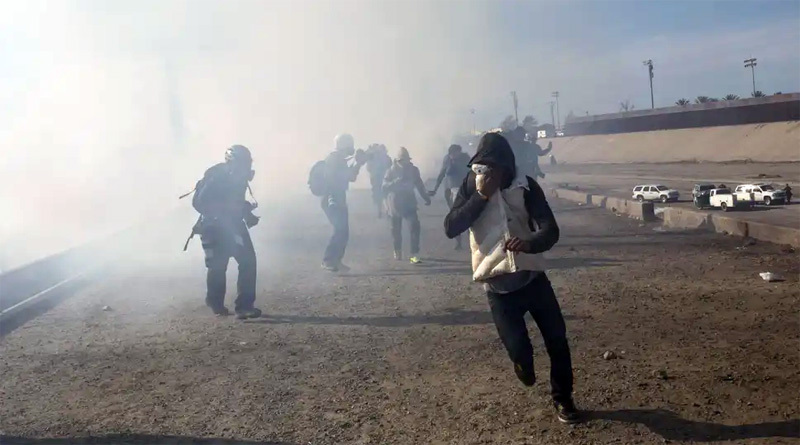 Honduran migrant Ana Zuniga, 23, told the Associated Press it was at that point she saw the US agents fire the tear gas, which enveloped some of the migrants. “We ran, but when you run the gas asphyxiates you more,” she told the AP, while cradling her three-year-old daughter Valery in her arms. Earlier, the CBC said all crossings at the busiest port of entry on the US-Mexico border have been suspended, after hundreds of Central American migrants pushed past a blockade of Mexican police. Later, it reopened the facility for pedestrian crossings. Television footage showed hundreds of migrants storming towards the US border after pushing their way past the officers. There were no reports of anyone being hurt, or of any of the migrants committing violence. The agency said both vehicle and foot crossings had been suspended at the San Ysidro port of entry hundreds of migrants gathered at the busy crossing point, seeking to apply for asylum in the US. “Southbound lanes into Mexico at the San Ysidro port of entry are currently closed. Updates will be provided,” the CBC’s San Diego office said on Twitter at around noon local time. It subsequently tweeted to say northbound vehicles, along with all foot crossings, had also been halted. Images and videos posted on social media Sunday afternoon showed hundreds of migrants from the leading Central American caravan pushing past Mexican riot police and rushing the border at the port of entry in San Ysidro, Calif., in a major test for both U.S. border authorities and Mexican officials.